Takrawesome | We've been busy! Our website and YouTube channel have been a little bit like a ghost town for the past few months and for that we apologise! It’s not because we’ve been slacking off – it’s the complete opposite! 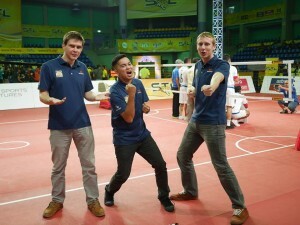 We found ourselves recruited to write articles for the official ISTAF (the International SepakTakraw Federation, in case you’re not familiar with the abundance of takraw acronyms) website – www.sepaktakraw.org. We’ve been writing a fist full of articles each week for them, and on top of that we also found our takraw knowledge and dulcet tones in demand to commentate a wonderful new Malaysian takraw league – funnily enough called the SepakTakraw League, or STL. So for the past two or so months we’ve been living out of hotel rooms in various corners of Malaysia typing up a storm and on the weekends found ourselves in front of a microphone enjoying the hell out of awesome sepak takraw match ups between seasoned faces and young new talent. Commentary has been a brand new endeavour for both Alex and I, but it’s truly great to be able to talk about the sport that we both love and we hope that we’re doing a good job! If you have any feedback about how our commentary is, and what we could improve upon – please do let us know! Drop us a line at contact@takrawesome.com, comment below, or hit us up on facebook. Massive thanks to everyone at Asia Sports Ventures for giving us the opportunity to sit at the commentary desk! So that means that if you’ve not been aware of our activities you can catch up on whole bunch of our words we wrote for sepaktakraw.org by clicking here. In the next little while we’ll be picking some of our favourite articles and putting them up on this site for future reference, so you can catch them here soon too. We’re hoping after that to have some discussions about the Australian National Team in the lead up to the 2015 World Cup in May, and then we’re planning on heading back to Thailand to get stuck back into our own personal journeys as players. 2015 has already started with a bang and it doesn’t look like it’s letting up any time soon. Oh also! We’re still selling sepak takraw equipment delivered to your door in Australia or New Zealand so don’t forget that you can order and have some new goodies arrive. While the site has been slow, we’ve been making an effort to keep facebook a little more updated. So if you’d like constant proof that we’re not dead or dying, best bet is to follow us on facebook. Plenty more Takrawesome things to come!